Located on the bottom floor of a Haggerston warehouse on the corner of Kingsland Road is the humble and beautiful Curio Cabal, who we started supplying coffee to around 6 months ago. Founded in 2013 as both a cafe space and a central hub for co-working they also house studio spaces for Creative Blocks, their brother company. Above, working away are the creatives of the area with downstairs being the spot for coffee, juice, food and meetings. A mixture of reclaimed scaffold furniture along with some mid century classics creates a warm and inviting space, and for me a much needed refuge on a cold London day! Pulling tasty shots of Red Brick on a linea classic alongside filter brews on the clever dripper they have firmly cemented themselves as a solid coffee destination on a road not short of competition. On this day they were brewing the Genesis, a favourite of ours here at the roastery and were doing a great job, with plenty of sweetness and a velvety texture. The space has a quaint community feel about it, it’s also the glue for a number of local creative spaces, including the Hive building, there’s an incredibly impressive cork board detailing upcoming events in the area and in the basement was where the delicious Pressery almond milk company began. Located just off the Regents canal, they are lucky to have an expansive covered outdoor section, which, on this day was empty, but come summer will be a sought after people watching spot which I shall be frequenting. Marty Latham has been working in the London coffee industry since 2010. 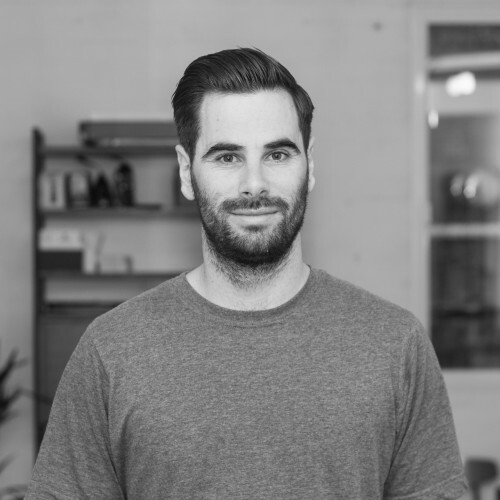 Having previously worked in design, he is now responsible for the retail and creative sides of Square Mile, usually on the other side of the camera.